An unforgettable coming-of-age story and a luminous portrayal of a dramatic era of American history, Rebecca Chace’s Leaving Rock Harbor takes readers into the heart of a New England mill town in the early twentieth century. On the eve of World War I, fourteen-year-old Frankie Ross and her parents leave their simple life in Poughkeepsie to seek a new beginning in the booming city of Rock Harbor, Massachusetts. Frankie’s father finds work in a bustling cotton mill, but erupting labor strikes threaten to dismantle the town’s socioeconomic structure. Frankie soon befriends two charismatic young men—Winslow Curtis, privileged son of the town’s most powerful politician, and Joe Barros, a Portuguese mill worker who becomes a union organizer—forming a tender yet bittersweet love triangle that will have an impact on all three throughout their lives. Inspired in part by Chace’s family history, Frankie’s journey to adulthood takes us through the First World War and into the Jazz Age, followed by the Great Depression—from rags to riches and back again. Her life parallels the evolution of the mill town itself, and the lost promise of a boomtown that everyone thought would last forever. Of her acclaimed novel Capture the Flag, the Los Angeles Times said, "Chace’s writing resembles a generation of New York writers heavily influenced by John Updike: Rick Moody, A. M. Homes, Susan Minot, and, more recently, Melissa Bank." With its lyrical prose and compelling style, Leaving Rock Harbor further establishes Chace’s position in that literary tradition. Rebecca Chace is the author of Chautauqua Summer, a New York Times Notable Book, and the novel Capture the Flag, which was recently adapted into a short film. Chace cowrote the screenplay (with director Lisanne Skyler) and acts in the film. Chace is also the author of several plays, has contributed to The New York Times Magazine and The New York Times Book Review, among other publications, and teaches at Bard College and the MFA Creative Writing Program at City College. She lives in New York City. "An irresistible read in part because its protagonist, Frankie Ross, seduces us on the first page and never surrenders our affection, but also because fictional Rock Harbor feels as real as she does. "Rebecca Chace’s eye is sharp, whether she’s writing about New England cotton mills in the years surrounding the first World War, bathing in the Atlantic -- wearing a corset or wearing almost nothing -- or eating lobster and drinking champagne in a fading but grand seaside hotel. Frankie Ross, the narrator of Leaving Rock Harbor, doesn’t manage her life sensibly, but she’s lovable because she can love, and it was a great pleasure to read her story." "Chace has deftly and seamlessly interwoven a love story, an elegy for a vanished way of life, and an account of a crucial and neglected period in America's social history. Nobody who reads this moving, evocative and sure-handed novel will ever forget Frankie and her world." 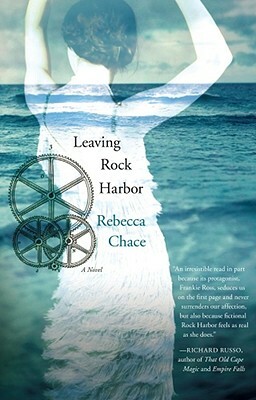 "Rebecca Chace’s Leaving Rock Harbor is beautifully constructed, tender, and irresistibly readable. It signals the coming of age of a great talent." "Leaving Rock Harbor brings to life the world of an early twentieth century mill town with rich detail and simple grace. Chace writes movingly about what is both gained and lost in the name of progress, not only for her characters, but for us all."